It’s true. But, sometimes, looking around, there isn’t a way through. Sometimes the door is slammed shut in your face and all the others are locked tight too. Sometimes the news isn’t hopeful, but terminal. Sometimes you hear “health management” when you were hoping for “treatment.” Sometimes all the encouragement in the world can’t convince the people in authority to say yes. Sometimes…you know the Lord has called you, led you, brought you…but you have no idea how to continue. The path has run out. Still, He says press on. 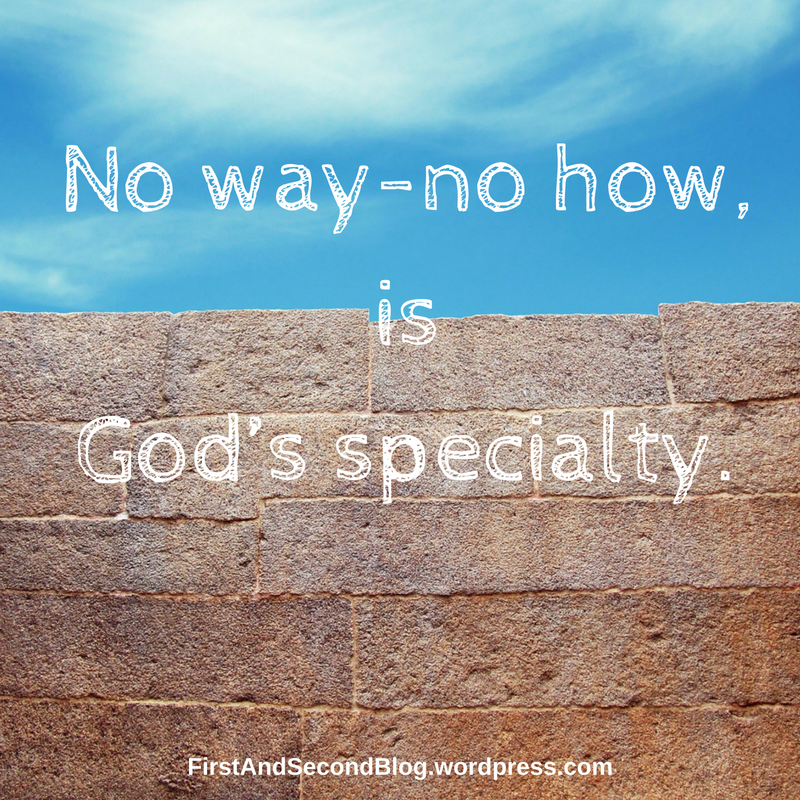 No way-no how, is God’s specialty. The Israelites on the edge of the sea knew it. They didn’t devise a plot using floaties or rafts to make the voyage across. Three friends didn’t perfect the first Nascar firesuit before being thrown into the blazing furnace. Daniel didn’t come out of the pit buck-naked, having used his clothes to muzzle the lions. The people told getting into heaven was like pushing a camel through the eye of a needle didn’t find their answer on Honey, I Shrunk the Kids. Paul didn’t regain his eye sight and a whole new perspective on everything using a special form of Lasik. Each of these no way-no how impossibilities was met with a God possibility. In each of these scenarios, there was no way through. No plot to devise. No option left. Not for people with their natural limits. He makes the way and is the how when we face our no ways, no hows. A friend of mine recently shared about the Lord answering her family with miracles they didn’t even know how to pray for. That is so often the case in our lives. Sometimes our best prayer when we’re teetering on a precipice and the path has run out is “Lord, you know. I don’t. You do.” Aaaand wait. Aaaaand believe. Take a look at your no way, no how. Stare it down while you balance on your tip-toes. Your God, Our Lord, is the maker of possible. And He’s still making possibility anew. Bethany, what a beautiful exhortation you share in this post! And this: “The Lord doesn’t just come through, He makes the “through.” He does make the through. And yes, there’s often a lot of waiting and choosing to believe involved. And trusting. Always the trusting. I’m so glad God knows the plans He has for us. Though they seldom look like our plans, they are the right plans for us. Praying for you today, my friend. Jeanne! Thank you for sharing a piece of your story- I so appreciated it : ) I wrote this just a bit ago but didn’t know how to wrap it up and your story gave me a little faith boost to clarify the ending! I’m so grateful the Lord has the best plans, too! Yes! But God! He’s such an Adventurer! Nice to be your neighbor at 3DLessonsforLife! He definitely is the God of the impossible! I look over my life and see things that I would have deemed impossible, yet he pulled them off. Thanks for sharing!